Is Math Education Too Abstract? "There is widespread alarm in the United States about the state of our math education," wrote Sol Garfunkel and David Mumford in an op-ed in The New York Times last month. It led me to remember the opening salvo in a pitch for re-thinking math education -- that of Dan Meyer's TED Talk last year: "Math class needs a makeover: I sell a product to a market that doesn't want it but is forced by law to buy it." Students' attitudes are, indeed, alarming, particularly when we use students' performance in math to gauge (to praise, to lambast) the success of American education. But according to Garfunkel and Mumford, our concerns over math education are misplaced. Instead of worrying about it in terms of whether or not test scores show American students are keeping pace with their peers globally, we should be focused on rethinking what math education actually looks like. "Today," they write, "American high schools offer a sequence of algebra, geometry, more algebra, pre-calculus and calculus (or a “reform” version in which these topics are interwoven). This has been codified by the Common Core State Standards, recently adopted by more than 40 states. This highly abstract curriculum is simply not the best way to prepare a vast majority of high school students for life." The authors contend that the "traditional" math curriculum focuses too much on abstract reasoning and abstract skills. "Imagine replacing the sequence of algebra, geometry and calculus with a sequence of finance, data and basic engineering," they suggest. In some ways, that's a very appealing, if not highly practical solution: teach kids the math they need, and as such, be ever ready to answer their age-old question "When am I ever going to use this when I grow up?" Give students a grounding in math that is "applied" so that they can understand the "why" as part of the "how" it works. Contextualize math so that it makes sense -- practically and conceptually. Contextualize math so that it means something. Give students a reason to want, to need to solve a math problem -- a want or need that doesn't include "This will go down on your permanent record." But does thinking about "applied mathematics" mean necessarily that we have to steer clear of algebra and calculus as their own units in math education? 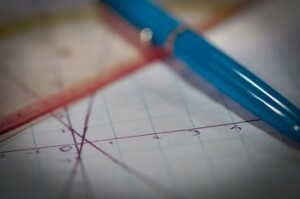 Does putting math in context mean that we cannot teach math in abstract? "Many of the students in my high school classes came from situations that many of us would find hard to imagine; the last thing they cared about was how to balance a checkbook or figure the balance on a savings account. But they loved solving problems. For another thing, reality is relative. The authors claim that 'it is through real-life applications that mathematics emerged in the past, has flourished for centuries and connects to our culture now,' and I agree. But the best mathematicians and scientists I know, and the students in my classes who really got it (and these were not necessarily the 'good students')—who saw the power and satisfaction one can derive from doing mathematics—all see mathematics as part of their real world."